When most people think of winter, they picture cold, snowy days and grey skies, but here in South-East Queensland it can mean warm, sunny weather in which people enjoy a stroll along the beach. That is exactly what it was like for our Redcliffe outreach today. For the second time we conducted an Answers Missions outreach. Once again we partnered with Operation 513 and believers from three different churches (including my home church, Samford Baptist Church). We set up our Free Bible and Literature Table at 11 a.m., and before too long people were coming up to take material. It is always encouraging to see people in today's culture wanting to learn more about God. Truly, we live in dark times, but the light of the gospel is still shining brightly. Our presence on the streets isn't just for the lost, but it is also for other Christians that we meet. It was particularly uplifting to have numerous believers come up to me today saying, "I am so glad you are here!" and "It is great to see Answers in Genesis sharing the gospel. We need more of this!" We even ran into a family from Fiji who were here on holiday. They were extremely excited to see Christians in public telling people of the Lord Jesus. In fact, these Fijians were so excited that they asked for some tracts to hand out (of course we gladly gave them some). They also asked about the possibility of Answers in Genesis coming to visit their homeland in the near future. There is truly a hunger among Christians to be equipped so they can reach out to the lost and answer the questions the world is asking. Due to the perfect weather, it was a bit harder to get people to chat for any length of time; as one of our team members said, "They are out here worshipping the creation rather than the Creator." 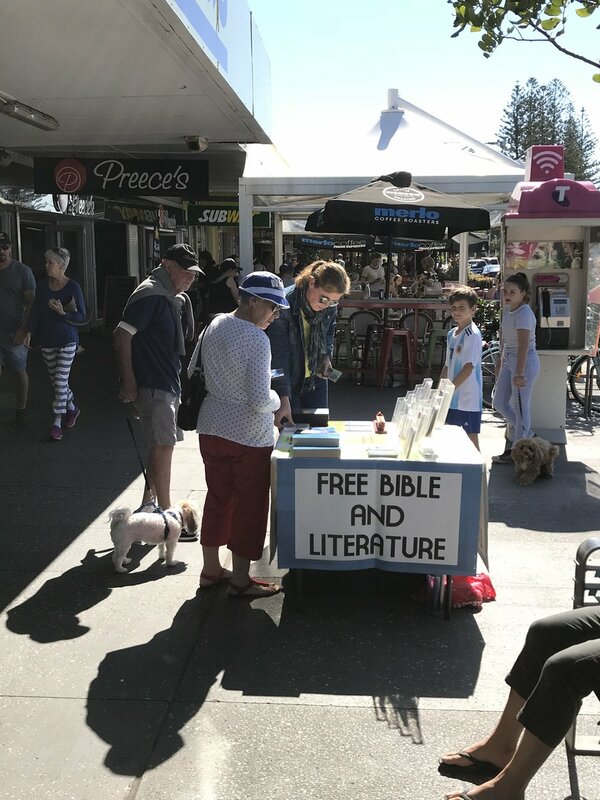 But even though people weren't overly keen on talking, many people were coming up to our Bible and Literature Table to take resources. In two hours we had nine requests for Bibles, and many people took booklets and DVDs. One extremely popular booklet (we ran out!) was "God's Word on Gay 'Marriage'" by Ken Ham. Non-Christians are very interested in the Bible's teaching on marriage. Even though our government has changed the nation's laws to attempt to redefine marriage (though you can't change what God ordains), I am optimistic enough to believe that, through the proclamation of the gospel, God will change the hearts and minds of the people and that one day we will see a return to biblical morality. We also had opportunity to minister to those involved with cults. 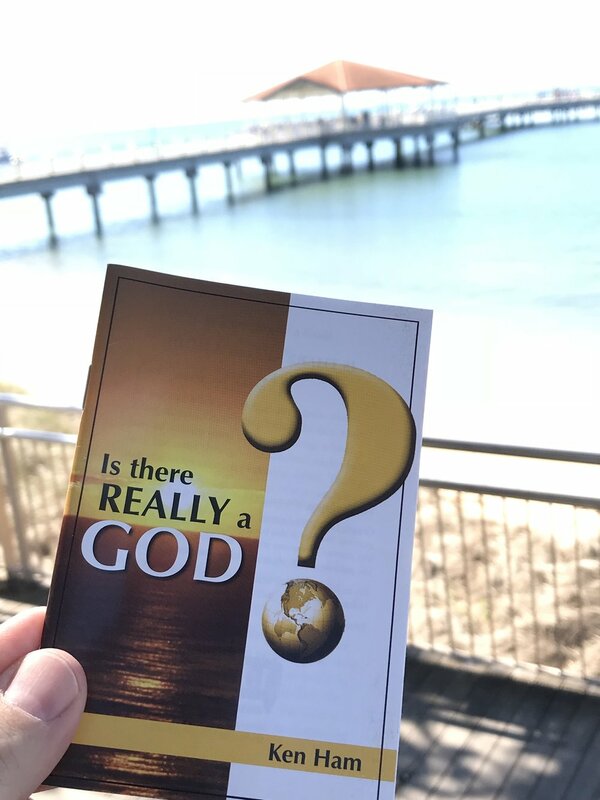 Mike, a deacon from my home church, got into a conversation with a Jehovah's Witness who was trying to convince us that only 144,000 people would go to heaven. When I was called into the conversation, I asked the gentleman, "Are those 144,000 servants of Jehovah the only people who will go to heaven?" He replied that they were. I then asked, "Are all those 144,000 Jewish male virgins?" He looked at me and said, "No, not all of them." Mike and I then took this gentleman to Revelation 14:1–4, which states that the 144,000 are made up of Jewish male virgins. He seemed a bit surprised at this passage and said he needed to look into it further. We then took him to Revelation 7:9 to show that many more than 144,000 will be in heaven. Finally, I encouraged him with the words of Jesus in John 14:1–6, where Christ promises to take all his people to be with him. The man said he would look up these verses in his Bible; he also took a copy of the booklet "10 Biblical Reasons Jesus is God." After I finished chatting with the man, Mike shared the gospel, stressing the importance of testing everything via the Word of God. Praise God for a wonderful day in Redcliffe. May the Lord Jesus rescue sinners!